Here is the passive income I received from both taxable and retirement accounts. Pretty decent way to start off the year. I should be pretty close to $1000 in February as well. 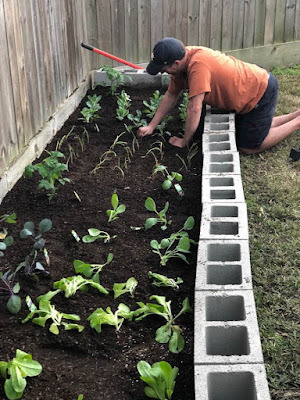 The weather has been in the upper 70s this week in Houston so I decided to start working on my raised vegetable garden. Lettuce, onions, bell peppers, broccoli, cabbage, a few other various veggies, and even a watermelon! nice pipe! a great list of companies paying you. And generally some bulky payments. gotta love growing your own vegetables. I'm really digging (no pun intended) my garden. I already have a few strawberries growing. Nice looking garden you have there, to hell with the dividends. JK. Sick CD income too, congrats on almost $1K! Thanks bro! I hear ya. I enjoy seeing a few signs of life in my strawberry patch far more than anything I did while on the hamster wheel! Strong start to 2019. We share a handful of names. Keep up the good work! Thanks you sir! You are killing it as well. Fantastic work. Love the veggie garden too. That's another thing on my list of things to do. I hope you jump into it! I am really enjoying the farmer hat even on a small scale. Awesome post on passive income. It's funny that so many people want to earn a large income and yet they are uninformed as to the importance of creating a passive income. This article will teach you more about how to do that.